Epic battles, stirring speeches, swashbuckling pirates, awe-inspiring astronauts, poised princesses, lost treasures, talkative teddies, heroic rescues, bustling restaurants, terrific tea parties - where can you find such an entertaining line-up all wrapped into one package? A child's brain! Pretend play makes all of this possible and more. Pretend play is often considered fun and frivolous, fueled by imagination and whimsy. In truth, it goes far beyond that. While kids are jousting in tournaments, operating a starship, and whipping up a gourmet meal, they are learning to solve problems, communicate, and think inventively. As they dive into these creative scenarios, they are building real world skills and individuality. Yes, they are having fun, but this kind of natural joy is key to keeping their minds and bodies engaged! Let's don our archeologist gear and uncover the 7 truths of pretend play! Kids can learn social skills at school, but they also hone these invaluable skills during pretend play. When children play, they are freely experimenting with social and emotional roles. Not only will this help them develop empathy and understanding, it will also boost self-esteem because they are discovering all that they are capable of! Group pretend play adds a new, nurturing dynamic. They talk, share responsibilities, take turns, and work through disagreements. Pretend play invites children to explore and become comfortable with the endless array of social cues they will encounter throughout life. For children, the world can be a scary and confusing place. Ever wonder why "playing doctor" seems to be a common choice? Pretend play gives kids the opportunity to confront unfamiliar, frightening scenarios in the comfort of their own play place. 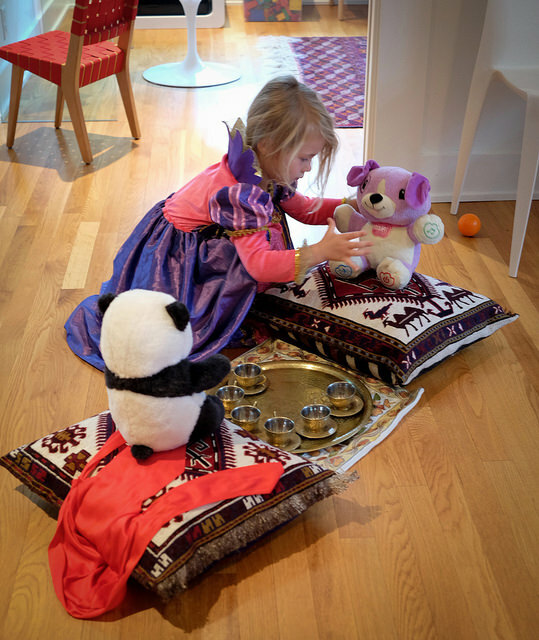 New emotions can be tough for kids to navigate; pretend play creates a sprawling stage where they can face these feelings, work through them, and create a healthy balance. It helps them feel more in control of their surroundings and any changes that they experience. As kids concoct masterful meals, conjure up elaborate adventures, or build epic forts together or alone, they are surmounting challenges with abstract thinking, communication, and brainstorming skills. Are the kiddos lacking a suitable roof for their fort? By uniting creativity with practicality, they will find a solution such as using an upside down kiddy pool. Listening, emotional regulation, balancing peer input, communication, negotiation, goal-setting, planning, taking action - all of these pretend play attributes are exactly what an adult needs to excel in the workplace too! This is a given! Pretend play is all about cultivating and activating the imagination. Picasso once said that "every child is an artist. The problem is how to remain an artist once we grow up." This is why pretend play is so important and why kids need recess! With the wonderful, whimsical power of their minds, kids are transforming boxes into castles and spaceships. Pretend play compels children to think big, imagine big, and dream big. Plenty of play keeps the natural talent of imagining nothing into something incredible thriving throughout life! I touched upon this before. Pretend play often involves becoming someone else. Kids are walking in other people's shoes, experiencing their problems and emotions. Of course, cultivating strong empathy takes time and maturity, but pretend play helps set the foundation for viewing life from the perspective of others. The colorful, unique conversations that my girls have while playing never cease to amaze me. Not only do they speak realistically, but they use vocabulary words I didn't even know they knew! Pretend play creates a platform for kids to employ words that they hear and learn in various situations. Not only does it help them become more comfortable with self-expression and speech, it helps connect the dots of language. Through dramatic play, kids of all ages are hard at work discovering themselves. They are learning about their abilities and interests. This self-awareness and individuality helps build self-esteem. When kids put their minds to it, they can become anything! I love watching my girls tie on their superhero cape and save the day or work as doctors who heal sick babies and animals. What are your children's favorite pretend play activities? I would love to hear all about it! All forms of play are fundamental to every facet of a child's development. Pretend play is priceless because it feeds children's imagination and individuality!